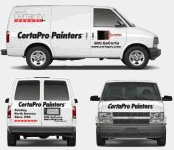 CertaPro Painters franchise for sale. Free CertaPro Painters painting franchise information. If you are looking for the opportunity to run your own Multi-Million Dollar Company, generate tremendous income and build asset value, then CertaPro is for you! If you are just looking to run a small painting business or want to “buy a job”…then look elsewhere. CertaPro is looking for driven business leaders who want to get BIG…FAST. You need to be a goal oriented and tenacious “take charge individual”. You provide the leadership…CertaPro will provide the Brand and systems to scale. CertaPro honors homes and the people who live in them by providing a customer experience that is unmatched. CertaPro customers are delighted by the service we offer. As a result, our customers have come to expect the unexpected from the largest painting company in North America. CertaPro is a full service painting company servicing both residential and commercial customers with superior interior, exterior and specialty painting services (e.g. faux finishes). Since 1992, CertaPro Painters has focused on refining its systems to help our franchisees scale. Our Comprehensive Marketing Systems “make the phone ring” by utilizing a combination of targeted local marketing and national advertising. Our Central Call Center provides your customers with “World Class” attention, service and support: so you can focus on driving your business. Our Integrated Technology Systems make it possible for you to track your production, sales and financials, regardless of how big or fast your business grows. It’s a “business in a box”…the “box” being a slick state of the art Tablet Computer that tracks everything “real time”… (Including the printing of a proposal while you are there with your customer)right in the palm of your hand! The “Train is Leaving the Station”…you had better get on-board! In the last two years our growth has been tremendous, we are quickly becoming “America’s Painting Company.Our success has been built through the collective efforts of a dedicated management team, experienced entrepreneurs and our reputation. Today, we have over 220 franchise owners located throughout the US and 8 provinces in Canada. Our plan is to double the number of franchisees within the next three years. We are there to support you every step of the way. CertaPro offers a comprehensive initial training program that covers all aspects of building a successful home-based franchise that will quickly scale to something much bigger over time. In addition, support is available to help market, recruit and train your key staff members in your efforts to scale. Some examples of these key staff positions would be: Office management, sales management and Production management. With CertaPro, you’re “working on the business…not in it. The relationship between Franchisee and Franchisor is stronger at CertaPro than anywhere else….just ask our Franchisees. In addition, CertaPro facilitates strong “Peer to Peer” interaction among Franchisees through our National Convention, Regional Meetings and Business Planning Groups. Management Learning Groups, Roundtables, Panel Discussion, and Business Strategy Meetings. At CertaPro, we help Franchisees connect, learn and improve from each other. To learn more about the CertaPro Painters franchise opportunity, simply complete the form below.